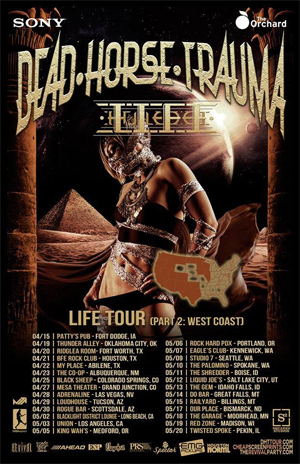 DEAD HORSE TRAUMA Announces West Coast Leg Of The "Life Tour"
DEAD HORSE TRAUMA is heading out on the road this April on the West Coast leg of the "Life Tour" in support of their new album Life. The tour kicks off April 15th at The Rock Room at Patty’s Pub in Fort Dodge, IA and concludes on May 20th at the Twisted Spoke in Pekin, IL. DEAD HORSE TRAUMA Coming to a City Near You Trailer can be viewed below. Since the release of The Unmerciful Infliction EP, (2008) DEAD HORSE TRAUMA has separated themselves from the pack with a high energy live show as well as an undeniable work ethic that has taken this band from a home town power house to a national touring juggernaut. "Life Tour" Part 3 is booking now via M7 Agency.